In 1981 Alison Lurie published The Language of Clothes, a meditation on costume and fashion as an expression of history, social status and individual psychology. Amusing, enlightening and full of literary allusion, the book was highly praised and widely anthologized. Now Lurie has returned with a companion book, The Language of Houses, a lucid, provocative and entertaining look at how the architecture of buildings and the spaces within them both reflect and affect the people who inhabit them. Schools, churches, government buildings, museums, prisons, hospitals, restaurants, and of course, houses and apartments—all of them speak to human experience in vital and varied ways. 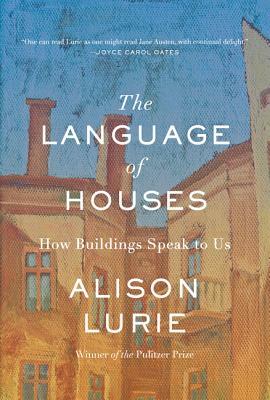 The Language of Houses discusses historical and regional styles and the use of materials such as stone and wood and concrete, as well as contemplating the roles of stairs and mirrors, windows and doors, tiny rooms and cathedral-like expanses, illustrating its conclusions with illuminating literary references and the comments of experts in the field. Accompanied by lighthearted original drawings, The Language of Houses is an essential and highly entertaining new contribution to the literature of modern architecture. Alison Lurie, who won the Pulitzer Prize for her novel Foreign Affairs, has published ten books of fiction, four works of non-fiction, and three collections of tales for children. She is a former professor of English at Cornell University, and lives in an old house in upstate New York with her husband, the Writer, Edward Hower.